Burns Night London @ Hammersmith Town Hall 19/1/19 - Buy tickets now! What is Burns Night London 2019 all about? Burns Night London is a real highlight of the year. It’s a chance to celebrate the life of Scotland’s National Poet – Robert Burns – in a way he would have wanted: eating, drinking, dancing, piping and poetry! Burns wrote some of the world’s most famous songs and poetry including Auld Lang Syne and we celebrate his birthday on the 25th January 1759. 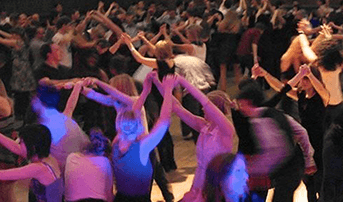 So how does the Ceilidh Club celebrate Burns Night London 2019? There is 3 hours of dancing to a wonderful band and caller. If you have never danced before then don’t worry, there’s a caller who will let you know the steps. You’ll pick it up in no time and part of the fun is learning the dances. At half time the haggis is piped in and there is the recital of Burns’ poem – the Address to the Haggis. If anyone wants to recite any other Burns poetry or songs then let us know. The bar area serves Haggis, Neeps (turnips) and Tatties (potatoes) buffet style. There are meat and vegetarian options available. You choose when you order. What’s the running order for the night? Doors open at 7PM and haggis, neeps and tatties is served buffet style between 7:15ish and 10ish. Dancing starts at 8PM and at half time (about 9:20) the haggis is piped in and there is the Address to the Haggis. The dancing then goes on until 11PM. We all end with Auld Lang Syne. Full price tickets are £37.50, concessions are £25. Concessions are students, unemployed, retired and NHS staff. Please bring proof of status with you. There will be no door tickets for Burns night so please book as early as possible. The night often sells out. You can buy tickets here. Based on feedback from last year we will be reducing the number of tickets available. There is no dress code but we appreciate tartan and people tend to dress up a bit more for Burns night. You won’t look out of place whatever you wear – some people dress up in the full highland gear and posh frocks, others come in their work clothes. If you make a bit of an effort you’ll appreciate it – and so will everyone else. Wear something comfy for dancing. Our celebrations will be held at Hammersmith Town Hall – one of London’s biggest dance floors. There’s no better way to get rid of those winter blues than 3 hours of dancing, haggis eating, poetry and drinking with friends old and new. If you would like to recite a Burns poem or song then please get in touch. …and finally if you would like to check out some of the moves and get fit at the same time then the Kelta Fit DVD will show you how. Use the code Health and get £5 off while stocks last.